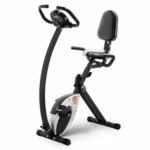 If you’re looking for an affordable recumbent exercise bike, the Marcy NS-653 is definitely one model to put on your list. Evidently, it’s not a fitness machine designed for commercial use or spin workouts, but it still offers you the possibility to perform light to medium intensity cardio workouts. And on the plus side, it features a foldable frame. Although the Marcy NS-653 recumbent bike is similar to the Best Choice SKY2380, its frame has a different construction. It consists of three main pieces rather than two, which are the main seat tube, the console mast, and the double-bar rear support. Of course, the seat assembly has its own bar and can be considered the fourth frame in the bike’s construction. Nonetheless, most of the bike frame is made of steel tubing; it features a fairly sturdy construction being able to withstand riders up to 220 lbs (100 kg), as its rear support consists of a double bar. The bike’s bases are simple, cylindrical tubes with plastic caps; they don’t have adjustable stabilizers, so it’s recommended to place the bike on a rubber mat for additional stability. However, its gravity center it pretty close to the floor level, so it offers excellent stability. 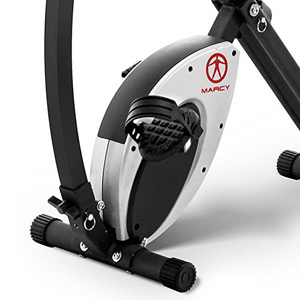 This Marcy exercise bike is far from being a large item of fitness equipment. When fully assembled it is 39″ (99 cm) long, and 22 1/4 (56.5 cm) wide, while the top if its front handlebar assembly reaches approx. 48″ (122 cm) above floor level. On top of that, the frame has a folding design, and with the frame folded, its dimensions become 25″L x 22.25″W x 47″H (63.5 x 56.5 x 119 cm). However, for the safe and unhindered usage of the bike, Marcy Pro recommends a clearance of at least 20″ (51 cm) all around it. Since it’s a small bike, it’s not extremely heavy. When fully assembled, it weighs only 52 lbs (23.5 kg). Due to this fact, it’s easy to handle and assemble by one person. Plus, the rear base features two small rollers which facilitate the bike’s relocation. 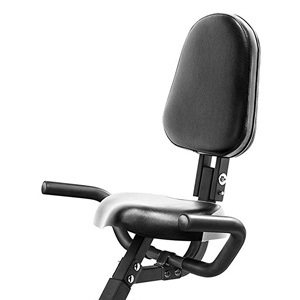 First of all, even though the Marcy NS-653 features a seat with a comfortable backrest, due to its folding design, the user’s positioning on the seat is somewhat between a conventional recumbent bike and an upright bike. But nonetheless, the seat offers excellent comfort. It integrates a thick layer of padding, being approx. 14″ wide. The backrest is also generously padded, offering great lumbar support. It does not recline backward, but can be folded forward to save some space when the bike is not in use. The upholstery on both the backrest and seat is made of durable vinyl material. The seat is adjustable, but its adjustment span isn’t very long. It only offers 4 adjustment positions, between 30 1/2″ and 32 1/2″ (77.4 – 82.5 cm) above floor level, with increments of 1/2″ (1.27 cm). This being said, the bike is made to accommodate users between 4’10” 5’7″ (147 – 170 cm). This Marcy recumbent bike is equipped with two sets of handlebars, one attached to the console mast and one to the seat assembly. None of them are adjustable; both feature rubberized grips for optimal comfort. The console mast is nicely curved towards the user, and therefore using the front handlebars when seated your position isn’t awkward as for other, larger recumbent bikes. 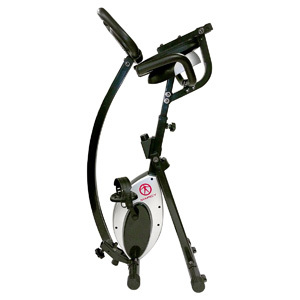 The Marcy NS-653 exercise bike features a manual magnetic resistance system. This means you don’t have to connect it to a power source in order to operate it or to benefit from resistance. The whole resistance mechanism consists of a magnetic brake pad placed close to the bike’s flywheel, and connected to the turn-knob on the middle frame tube via a steel wire. The turn of the knob will change the placement of the magnetic brake pad in relation to the flywheel, which increases or decreases the resistance on the pedals. There aren’t any resistance levels specified on the resistance knob, as for the ProGear 190, for example. You simply turn the knob until you find the resistance setting that suits your training needs. But as a general idea, this bike does not offer the possibility to undertake highly intense workouts, and by no means can it support spin workouts. It is intended for light to medium exercising routines. The weight of the bike’s flywheel isn’t specified (anywhere), but since the bike itself weighs only 52 lbs (23.5 kg), the flywheel can’t be too heavy. It’s probably somewhere between 4-8 lbs. It’s perimeter weighted, though, delivering a steady pedaling motion and feel. Needless to say, since the bike features a magnetic resistance system, it uses a belt drive. Due to this fact, the pedaling motion generates almost no sound whatsoever. Also, since it’s a belt, it does not require any lubrication. The bike is equipped with a durable crankset, with steel crank arms; but evidently, it’s not made for standing up pedaling routines. The crank arms feature weighted pedals with adjustable straps. And finally, the bike’s Q-Factor is quite narrow. Due to this fact, there is no lateral stress on the knees and ankles during pedaling, which is quite a plus especially for users who must undergo recovery training. 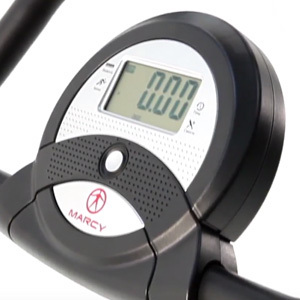 Since it’s a basic exercise bike, the Marcy NS-653 is also equipped with a basic exercise meter. This unit can track time, speed, distance, total distance (odometer), and calories. The bike is not equipped with pulse sensors of any type and the meter is not telemetric. Therefore, you cannot benefit from a pulse reading. So, in case you want to keep an eye on your heart rate interval you will have to use a separate heart rate monitor. Also, distance and speed can only be tracked in miles and respectively miles per hour. The meter unit is extremely easy to operate. It features only one (MODE) button. It’s somewhat similar to the unit of the Exerpeutic 1200 (only without the pulse reading). By pressing the button you can activate the meter’s SCAN function which will rotate your workout metrics, showing each one for 4 seconds. Or, you can select only one of the workout metrics to be shown on screen at all times. The unit does not have any programs, nor it is programmable in any way. Finally, the meter requires two AA (1.5V) batteries which are not included. It’s powered on when it detects pedal movement or if you press the button. It also has a “sleep mode” function to which will enter after 5 minutes of inactivity on the bike. This Marcy exercise bike is quite easy to assemble. The three main parts of the frame (i.e. console mast, rear support, and mid tube with the resistance mechanism) are already assembled. Therefore, you will only need to add the base stabilizers, the seat assembly, the front handlebar, the console and the pedals. This shouldn’t take longer than one hour. The manual provides all the necessary instructions for the assembly, and all the tools required for it are included. Since the bike features a magnetic resistance system, the brake pad isn’t a wear part, so it doesn’t require replacement. The bike uses a belt drive, therefore transmission doesn’t require lubrication. So, basically, the whole maintenance requires you to wipe the dust off the bike, and periodically inspect the frame for loose bolts and parts. Fitness meter doesn’t have backlight. 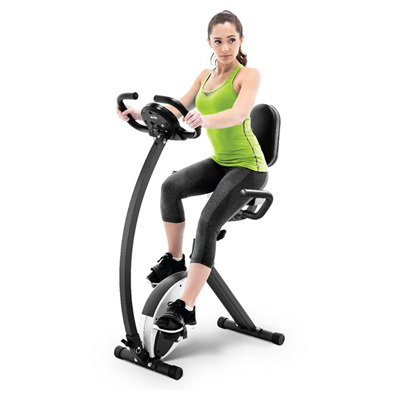 The Marcy NS-653 is a folding exercise bike, featuring manual magnetic resistance, and a comfortable, generously padded seat with backrest. Even though it’s a small bike, meant for home use, it can support users up to 220 lbs. It’s equipped with a basic fitness meter which can track time, speed, distance, and calories. It’s a great fitness machine for light to medium cardio training, rehab training, muscle toning and weight loss. And finally, it’s an affordable bike, offering excellent value for the price.